Although still an amateur photographer after more than forty years behind the lens, I consider myself more than fortunate in having been given a number of significant photographic opportunities over the years. Perhaps I have just been lucky, however I must admit to always having a specific photographic project under way at any one time and this tends to concentrate one’s focus and open up opportunities. It maybe this frame of mind could have been instrumental in some of these opportunities coming my way or it may be just being in the right place at the right time. Photographing international motor racing with sponsorship from a major film company was certainly a product of the latter. Photography for me started in the 1960’s not long after I started work at Flight Refuelling Ltd, the company formed by the aviation pioneer, Sir Alan Cobham. Like many people I had always had the ubiquitous Kodak Box Brownie camera and just occasionally was allowed to take pictures with my father’s folding Kodak but my photography was limited to the usual family snap shots and recording places visited. It was Wing Commander Arthur Paton, one of my first mentor’s at Flight Refuelling, who introduced me to photography as a rather absorbing hobby. Every week he passed on to me his well read copy of Amateur Photographer. He was a great character and like many of the former RAF flyers and engineers I found myself working with a strict disciplinarian. To ensure I had read the magazine he had passed on to me I would always be quizzed on it’s content the following week and in particular on the technical articles before the next week’s copy was released. On reflection, I owe him much more than I really ever gave him credit for at the time. At this time, I had no idea as to what extent my new found hobby would later compliment my interest in motor racing. Just where the motor racing interest came from I have no idea but I suspect my grandfather played a significant part. Certainly as a child I seemed more interested in aircraft and flying and always wanted to become a pilot. Regrettably, poor eyesight saw an end to that career. I think it therefore must have been my grandfather’s influence. Although a farmer, countrymen and great horseman, he always had an interest in cars and owned a wide variety including a sporting Wolseley Hornet. He also introduced me to local car club events by taking me to various hill climbs and autocross so I guess I have to thank him for sewing the seed which later developed into a life long interest. He also supported me in early competitions with a Mini 850 and shielded much concern from my mother who never knew of my competitive activities until she spotted my name on the back of Motoring News following a rare moment of success in a hill climb event. During the early to mid sixties, I frequently carried out photography at meetings and later became a marshal with the British Automobile Racing Club. Race meetings expanded the opportunity to wander around the paddock during lunch breaks, capturing images of cars and drivers with my Werra and fixed Tessar lens (remember those!). I progressed to a second-hand Praktica SLR with Tessar 50mm lens, later adding a 30mm Lydith wide angle for which I still remember paying the princely sum of £8. I also added a Soligor 180mm and later a 300mm manual preset telephoto lens which of course helped with action shots taken from spectator enclosures when not on duty. I must stress this class of equipment was very amateur in status and all purchased on a very tight budget. 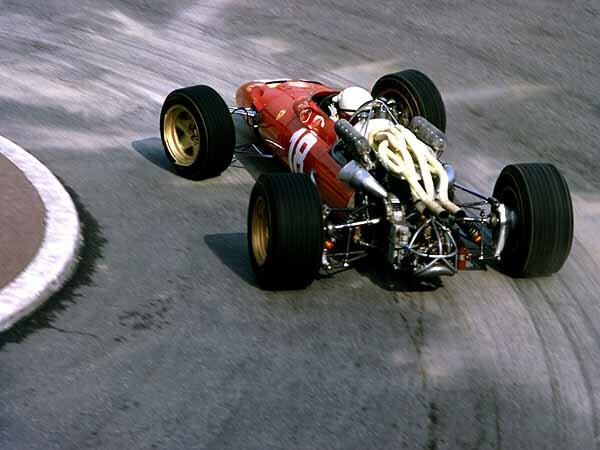 Motor racing and photography combined particularly well during a visit to the Monaco Grand Prix in 1967. Travelling down to Monaco with friends and all of us on economy budgets meant grandstand seats were strictly out of the question and if any photography was to take place a suitable viewing location was essential. Even in those days there were not too many locations around the principality’s street circuit offering uninterrupted views of the racing. I remember looking up at the many hotel and apartment balconies which looked down on the circuit providing more than a grandstand view of the action particularly at St Devote and the Casino Square but they were well out of our reach. Then at the end of the Casino Gardens we found some steps and a balustrade which looked down on the circuit at very close quarters. 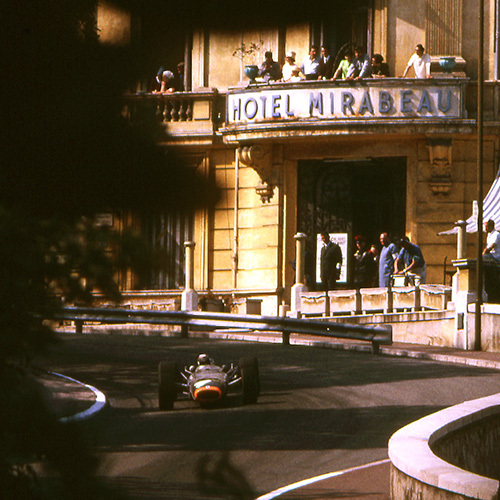 From here the cars were visible as they rounded the corner in front of the famous Mirabeau Hotel and briefly accelerated downhill before braking heavily to negotiate the Station Hairpin. Leaning over the balustrade I was able to look down into the cockpit of the cars and to follow them down to the hairpin turn. This location provided me with some of my most rewarding motor racing images. Jackie Stewart in his BRM passing through the afternoon shadows with the backdrop of the Hotel Mirabeau, Graham Hill with arms outstretched in the cockpit of his Lotus, Chris Amon in the Ferrari passing through the late afternoon shadows immediately beneath me and perhaps more poignantly, Lorenzo Bandini in his resplendent Ferrari entering the Station Hairpin for the last time just before his fatal crash on the harbour front after he exited the tunnel. It is simply not possible to photograph from that same location today, making my images particularly memorable and historic. On my return I decided to make more of photography and joined my local camera club. In many ways this was a turning point, not only for my photography but the opportunities I found along the way. Wimborne Camera Club based in my home town of Wimborne Minster in Dorset was a very forward thinking and active organisation. At the time I joined they were starting a new venture of Photographic Teach-In weekends to be held at an old country house managed by the YHA called Avon Tyrell in Hampshire’s New Forest. These weekends became a landmark on the UK photography calendar and attracted many prominent names from the photographic media including Reggie Mason one time editor of Amateur Photographer and George Hughes the features editor. Picture editors and many famous press, photo journalists and studio photographers of the time including advertising photographer Sam Haskins, also gave their time in support of the events. It was at one of these Teach-Ins in 1968 that I met John Shire, the Advertising Manager for Agfa Gevaert. John was very keen to promote their new Agfa CT18 colour film and after seeing some of my motor racing images offered me the opportunity to photograph the international motor racing scene for the Agfa Gevaert Lecture Programme. I was given a brief to capture the colour and atmosphere of the sport, not just the action shots but the drivers, teams and personalities, mechanics and cars, abstract images and anything colourful associated with the sport. Of course not all the motor racing magazines at this time were using colour other than on the cover or the occasional centre spread and certainly the newspapers were only using black and white, so Agfa were certainly at the forefront in using colour for motor racing photography. I have since been told that this fact alone has accounted for the popularity of my images nearly forty years later. From my point of view I had always admired the work of two motor racing photographers. The monochrome work of Louis Klementaski and later the colour work of Horst Baumann and his superb book with Ken Purdy The New Matadors and here was I, an amateur photographer being given the opportunity to focus my lens on the same sport that they had both captured with such realism and artistry. The prospect was both exciting and somewhat daunting. Audrey Tapson, John Shire’s personal assistant arranged the necessary ‘Photographer’ passes and fifty rolls of Agfa CT18 arrived on my doorstep; the rest was up to me. It helped of course that I knew my way around the circuits. As a track marshal, over the years I had made mental notes of the best positions to see the cars in action. One of the most impressive locations at Silverstone for example was the inside of Copse Corner, where only a small knee high wall lay between you and the cars. In the right position you could capture the cars almost head on as they drifted through Copse. Even with a standard 50mm lens you could fill the frame with the car. It was a favourite place for photographers but I believe the new Silverstone layout has now lost that facility, apart from which modern safety standards would no longer allow such close contact. Motor Racing is a dangerous sport and one must always be aware of this fact, not just out on the circuit but also in the pits and paddock where cars are being manoeuvred. Equally important I got to know where and more importantly when not to photograph the drivers at close quarters. At times the atmosphere can get pretty tense, particularly when things are not going too well for a driver or team. I therefore decided to do pit portraits during practice sessions and either ask first or work unobtrusively. In reality I always found the drivers and teams of that era very approachable and helpful. I was however, rather conscious of my amateur status, particularly with an amateur Praktica around my neck when mixing it with the professional sports and press photographers with their Nikon Fs. Undaunted, I continued to concentrate on capturing the images within my set brief. This amateur status however led to a couple of amusing incidents, the most notable of which was during a very wet International Daily Express Trophy at Silverstone. Throughout the race Jack Brabham had an exciting dual with Jochen Rindt in the Lotus and as the race entered the closing stages I made sure I was in an early position near the chequered flag. As the green and yellow Brabham came into view through Woodcote Corner there was much jostling for position among the photographers and I found myself next to the late Victor Blackman from the Daily Express who also wrote a weekly column for the Amateur Photographer. Realising this was the Daily Express Trophy, I considered he should really have any shot that was going and moved aside to allow him a better view. Discretion being the better part of valour!! I took my shot and retreated to an area near the pits entrance where I spotted BBC commentator, Raymond Baxter waiting to interview Jack Brabham. In those days the winner’s rostrum was on the back of a lorry or trailer on which the winning car was loaded for a lap of honour with the garlanded winner. As I photographed from track level imagine my surprise when Raymond Baxter beckoned to me to go up on the lorry with himself and Jack Brabham. Not needing to be asked twice I jumped up and photographed a delighted and garlanded Jack Brabham holding the famous trophy at close quarters. At last my own scoop. On a more amusing note, towards the end of my opportunity with Agfa, extreme hilarity was caused when I signed on in the press office with other photographers one morning in August 1970 for a Formula 5000 event at Thruxton. Naturally I signed on as representing Agfa Gevaert and it was this which caused the uproar. What was so amusing about that? Well, this major international event was being sponsored by Kodak! Looking back now, it was an amazing experience and a tremendous opportunity to photograph my favourite sport at a seemingly ‘professional’ level through 1968 and 1969. These years were very experimental and at times tragic. They were also the years which saw the motor racing scene become increasingly commercial and far more controlled. I felt I was entering a challenging time for the sport and certainly a challenging time for me. 1968 in particular was the year of change in F1. Along came commercial sponsorship and of course the infamous wings. However 1968 will always be remembered for the untimely death of Jim Clark during an F2 event at Hockenheim in Germany. I well remember only a week later, the cloud which hung over the BARC’s inaugural F2 event on Easter Monday at Thruxton where I was on duty, marshalling on the pits straight. Pole position for the F2 event was left open in honour of Jim Clark. 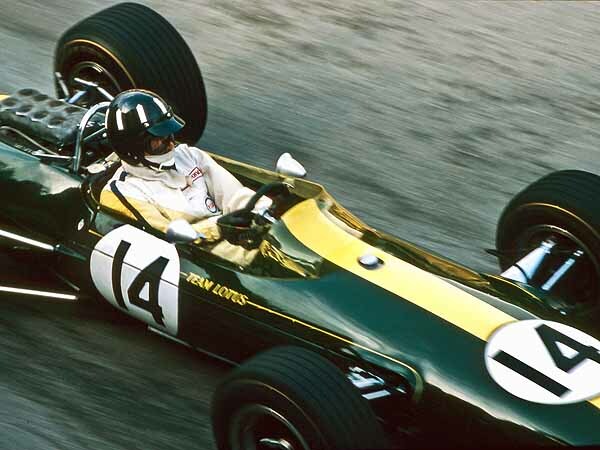 1968 also saw a sad end to the famous British Racing Green national colours, the green and yellow lotus F1 cars of Colin Chapman’s team were changed into red, white and gold, following sponsorship from Gold Leaf cigarettes for example. 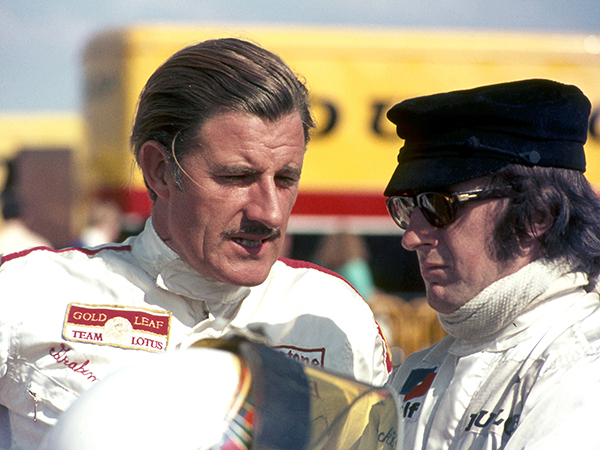 Graham Hill remained in the driver’s seat from where he was to claim his second World title and after Jim Clark’s loss, Jackie Oliver joined Lotus from BRM. The French Matra team however managed to retain their French Blue colours with drivers Henri Pescarolo and Jean-Pierre Beltoise, as did Ken Tyrell who entered the arena with his Matra-Fords and Jackie Stewart as driver making a formidable duo for the future. Ferrari of course retained their resplendent red - a Ferrari in any other colour would of course be unthinkable. Their driver line up for 1968 was New Zealander, Chris Amon and Belgian, Jackie Ickx. Bruce Mclaren was supported by 1967 world champion Denny Hulme in their vibrant orange cars and the popular Swiss, Jo Siffert scooped a major victory at Brands Hatch in the 1968 British Grand Prix driving Rob Walker’s Lotus. This was Siffert’s first win for seven years. 1968 was also the year of aerodynamic experimentation with high front and rear wings developed to increase downforce. From a visual point of view, and you would expect this comment from a photographer, they were far from aesthetically pleasing. In my view racing cars were never meant to have high spindly mounted wings. Over the years we had naturally accepted and become accustomed to cars which had a degree of style with a design for speed. I can’t remember who in race car design said “If it look’s right, it is right” but they were certainly right. The 1968 Grand Prix car was a structure with an appendage and it certainly did not look right. Following several structural failures, usually with disastrous results, rules were changed for the Monaco Grand Prix of 1969 to ensure downforce availability but as an integral structure of the car, so we returned to race cars looking more like racing cars and not experimental aircraft. Formula One was also given a tremendous boost in 1968 with the availability of the now famous Ford DFV engine. This widely available option opened up the Formula One World Championship to private teams who suddenly found themselves with a highly competitive engine option at a price, which in F1 terms was affordable. 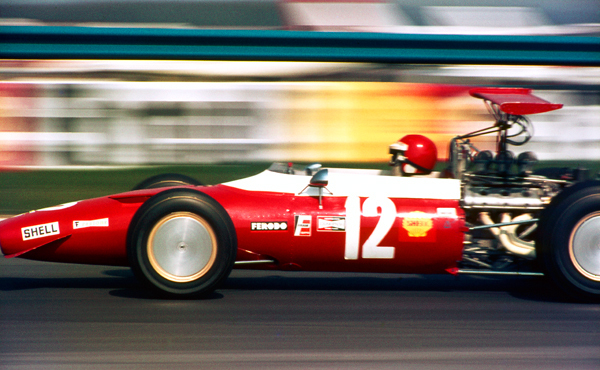 My second season of photography for Agfa was 1969, unquestionably the year of Ken Tyrell and Jackie Stewart. It is hardly surprising that Jackie Stewart featured significantly in front of my lens throughout this season in both F1 and F2 racing. With Ken Tyrell’s Matra being the car to beat, Matra had withdrawn their own team and drivers Johnny Servoz-Gavin and Jean-Pierre Beltoise completed the line up with Jackie Stewart. 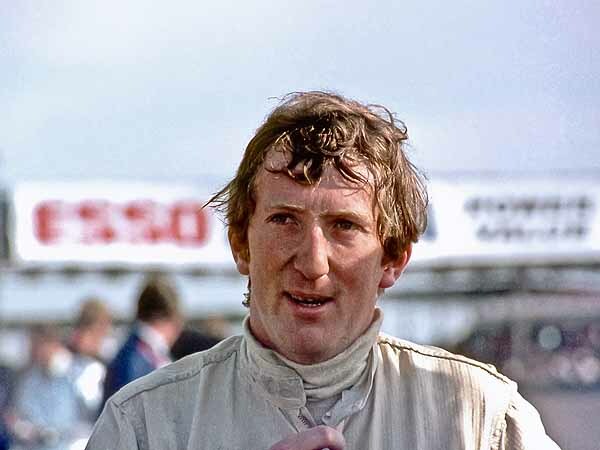 For this season Jochen Rindt changed from Brabham and joined Graham Hill at Lotus with owner/driver Jack Brabham being supported by Jackie Ickx. Jack Brabham also dropped the Repco engine and joined the DFV supremacy. With Honda withdrawing from Formula 1 involvement John Surtees joined the former Lotus driver Jackie Oliver at BRM. During this year some of the major teams decided to experiment with four wheel drive cars but in reality they were not successful and design effort focused elsewhere, particularly in the region of downforce. 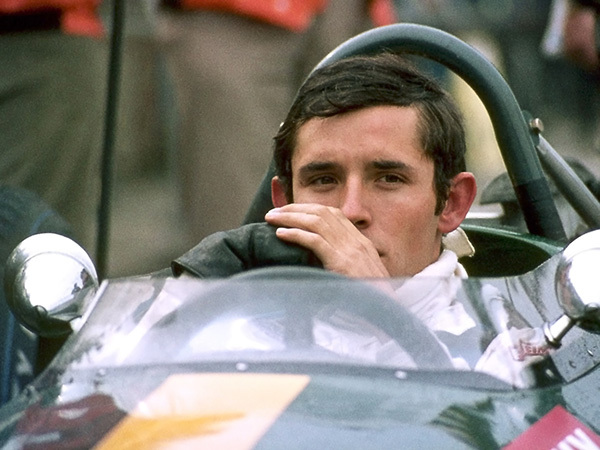 This period did allow me to capture an image of John Miles, son of actor Sir Bernard Miles sat on the rear wheel of the Lotus 4WD car at Silverstone. Later both driver and car disappeared from the scene, John Miles choosing engineering to race driving for a career despite some prominent drives with Lotus. My 1969 photography centred on F1 at Silverstone with the Daily Express Trophy won by Jack Brabham in wet conditions and the British Grand Prix which won by Jackie Stewart after a race long duel with Jochen Rindt who had to pit in the final stages with a loose wing. Stewart and Rindt also continued their duel at the BARC’s Thruxton F2 event which was a particularly colourful and spectacular event. So ended my brief but in depth session of professional motor racing photography with Agfa Gevaert, however I did continue with further motor sport photography into the 1970 season but largely in my own club and meetings at Thruxton. I later returned to being an official at events until work and family commitments dictated otherwise. John Shire and his team at Agfa’s Brentford headquarters were pleased with the results and Amateur Photographer Features Editor, George Hughes was asked to write the script for the Agfa Lecture Service programme. When the original images were received back from Agfa I set about putting together ‘Race’, an Audio Visual feature using dissolve projection, commentary and soundtrack. Since then the images have been stored until I retired from Flight Refuelling Ltd in 2004. I have since scanned in excess of 300 transparencies and restored some of the now faded images in Photoshop. A selection has since been placed on my website, where they have received significant interest from magazines and authors researching or writing about motor racing in the 60’s. Richard Copeman’s excellent website www.historicracing.com includes my work in a well presented gallery and Motor Sport magazine also featured my work for three months in 2007 for a feature entitled “Rewind to the Sixties”. This was seen by readers worldwide from whom I have received many requests for prints. Former mechanics, driver’s wives and even owners of now famous and restored cars have requested prints for their collection. I have to admit to being somewhat surprised by the reaction after all these years, but everyone seems to be unanimous in their view that maybe my brief to capture the colour and atmosphere of the occasion, allowed my camera to focus on the more personal elements of the sport, the paddock scenes in particular have been the most popular. One magazine publisher has even used some of the images in a fashion feature focusing on the driver’s wives, pit crew and spectator fashions of the day commenting that I was present to capture motor racing’s first WAGS!! Of course the sport itself has changed dramatically over the years and everyone likes nostalgia, but it does seem that the end of the sixties was very much the end of an era. I may never have made it as a full time professional photographer but I certainly had a tremendous opportunity which will always be remembered with affection. In today’s very commercial and highly regulated Formula One scene I doubt such an opportunity for an amateur photographer could ever be repeated. Now we have the book Out of the Shadows published by Halsgrove in September 2009. Little did I realise all those years ago that I would see those images taken at Monaco in 1967 with an amateur camera receive such international acclaim.